Did you know that the fastest that your swimmer is ever moving in a race is after the start and after every turn? At this high performance swim clinic, the swimmers will work on starts, backstroke starts, and underwater dolphin kicking on Saturday. Then on Sunday, they will focus on flip turns, open turns and finishes. Your clinicians will be two-time Olympian Chloe Sutton, Olympian Luis Martinez, and 15-time All-American Michael Dunderstadt! Sign up for one or SAVE by signing up for BOTH sessions! Scroll down to read more about the curriculum at this clinic. Chloe, Luis, and Michael will be in the water leading 4 sessions, two for each age group. This camp is designed for competitive swimmers only. BACKSTROKE STARTS: Getting into the right ready position with a straight back, hips high on the surface of the water, and feet positioned to get maximum power is extremely important to being able to execute a fast and clean backstroke start. Chloe will work with swimmers at this session to achieve a beautiful back arch over the water so that they can have an advantage in every backstroke race! Most age group swimmers add in extra movements on their open turns, flip turns, and finishes that slow them down and prevent them from carrying their momentum through the turn and into the finish! Even at Olympic Trials we see many very fast swimmers who miss making finals and even the Olympic team because of the quality of their turns and finishes! The turn and finish are both opportunities for a swimmer to actually GAIN MOMENTUM, when in fact most swimmers actually slow down. At both of these sessions, Olympian Chloe Sutton will be in the water teaching your swimmer how to improve their turns and finishes so that they can drop time! FLIP TURNS: Your swimmer will learn how to carry their momentum through the turn to get in and out of every wall faster. Swimmers will practice accelerating into the wall with long strokes and then using their core and arms to get through the turn. They'll practice planting their feet on the wall for a powerful pushoff in the perfect streamline. Chloe will give the swimmers drills and exercises to help them master this athletic skill now as well as in the future! What's more nerve-wracking than swimming in the Olympics?! Swimming in a sea of jellyfish! Chloe Sutton has done both! 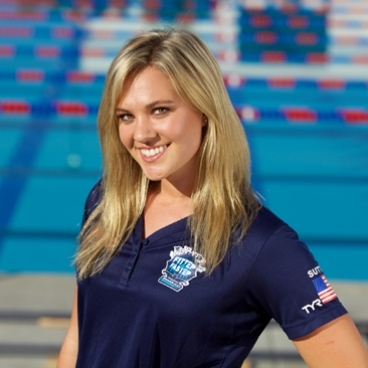 She is a 2-time Olympian in both open water AND pool swimming. 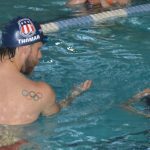 Her approachable personality and positive attitude when teaching perfect technique will give you the confidence you need to swim faster.